I occasionally take a second look at products that have been substantially updated since their original Mac Gems reviews—especially if those products are among our favorite Gems, and especially if the changes warrant a new rating. Today I’m taking just such a look at two recent Gems, Fantastical ($20; Mac App Store link) and Moom ($5; Mac App Store link). I originally reviewed Fantastical 1.0 back in May, praising it as “a great package that handles—with an attractive interface and some impressive options—most of the things you use your ‘big’ calendar program to do.” If you’ve never used Fantastical, its icon lives in your menu bar, displaying the day’s date. Click the icon, and a beautiful calendar drops down, showing the current month, with upcoming events listed below; you choose which calendars’ events appear, as well as the number of events or days’ worth of events. Click an event to view its details, or click a date to see its events; a search field lets you quickly find events. It’s also easy to create new events from within Fantastical. You can double-click a date and then fill in the event’s details, but Fantastical’s standout feature is its natural-language event creation. You just type (in English) a conversational description of the event; Fantastical parses your text to fill in the details accordingly. Press Return, and the new event is created, letting you get right back to work. (For example, if I type Macworld Staff Meeting Friday 10a Rm500 /work, Fantastical creates a new event, Macworld Staff Meeting, in my Work calendar with the upcoming Friday as the date, room 500 as the location, and 10 a.m. to 11 a.m. as the time.) Include the name of an Address Book contact, and Fantastical can add that person to the event’s invite list. Lion’s version of iCal offers similar functionality, but Fantastical simply works much better, and Fantastical works with any calendar you’ve set up in Apple’s iCal, BusyMac’s BusyCal, or Microsoft’s Entourage or Outlook, as well as with MobileMe, iCloud, Google Calendar, and Yahoo Calendar accounts. 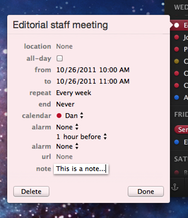 Fantastical 1.1 now allows you to edit events and add notes. What’s new: Since version 1.0, the developer of Fantastical, Flexibits, has updated the program four times, and those updates have brought a number of new and useful features, as well as the usual minor improvements and bug fixes. The most significant new features are the capability to edit and delete events—actions that previously required you to open your preferred calendar program—and the capability to add and edit notes for events. My other favorite new feature is the Fantastical menu extra (22kb download link). Run this tiny program, and you can reposition the Fantastical menu anywhere in the menu-extras area of your menu bar. (I prefer it near the right edge of the screen, next to Apple’s clock menu.) Other new features let you add multiple alarms automatically; use “launcher” apps such as LaunchBar and Alfred to send data directly to Fantastical; and use several Lion trackpad gestures and additional keyboard shortcuts to navigate events and calendars. In my original review, I wrote that Fantastical doesn’t include every feature you might want. Fantastical 1.1 has closed that gap considerably, to the point where many people could get by without ever opening iCal. Moom now lets you draw custom window sizes and positions on its screen grid. What’s new: Moom has been updated eight times since my original review, adding dozens of improvements and new features. For those who favor mouse-pointer control, my favorite new feature displays, just below the zoom-button presets, a grid representing the current display and the window's current position on it. Simply draw a rectangle anywhere on that grid, and the window is resized and repositioned accordingly. (As you’re drawing, a useful window-preview outline appears on your screen to show you exactly where, and how big, the resulting window will be.) 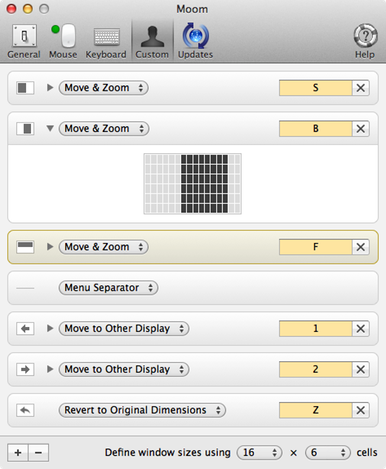 It’s a quick-and-easy way to precisely move and reposition windows, and you can choose, in Moom’s settings, the number of rows and columns in the grid—in other words, how precisely you can resize. You can also access and use this grid with keyboard commands. But you aren’t limited to Moom’s presets or manually drawing window positions on a grid, as Moom's new Custom settings screen now lets you configure custom presets and actions. The available options include various combinations of moving and resizing windows to custom sizes and positions, moving and resizing windows by specific increments, and moving windows between displays. Your custom actions appear in a new menu within Moom’s zoom-button palette. You can also now create custom presets with keyboard shortcuts. You can also assign a keyboard shortcut—single-key or multi-key—to each custom action. Multi-key shortcuts work at any time, without requiring you to bring up Moom’s keyboard-control overlay. To access an action using a single-key shortcut, you first bring up that overlay, then press the one-key shortcut. (As an example, I’ve assigned B to a preset that represents my favorite window size and position for BBEdit.) To help you remember your shortcuts, whenever you bring up the keyboard-control overlay, you can now see a “cheat sheet” that displays all available actions and shortcuts. The other big new feature is multi-window-layout snapshots. If you’ve got a favorite setup, with each program’s windows meticulously organized, you can take a snapshot of that layout and then use Moom to restore it at any time. This feature can be helpful for restoring order, but it’s also quite useful if, for example, you’ve got a Mac laptop and you regularly switch between using one display (just the laptop’s) and multiple displays (the laptop’s and an external display while at the office). You can manually trigger the appropriate snapshot, but even easier is Moom’s setting to automatically restore a snapshot whenever you switch to a particular number of displays (or whenever your display matches a particular resolution—useful if you switch between different single displays). Moom’s developer, Many Tricks, has also added a number of minor-but-useful options and tweaks; and Moom now works with more programs, better supports multi-display configurations, and includes some basic AppleScript support. And both mouse and keyboard control now work with Quick Look windows. There are many window-management apps out there—I’ve seen literally dozens debut in the past year alone. I’ve tried most of them, and Moom remains my favorite by being simple enough for new users, while offering plenty of features and flexibility for those who crave more options. It’s also one of the few that can satisfy both keyboard junkies and those who prefer to use a mouse, trackpad, or trackball.